How do you build a brand? Have you consciously built your brand, ingredient by thoughtful ingredient, or has it kind of fallen into place over time? Whether or not you have purposefully built your brand, you certainly have one. Ask any of your customers what your brand is, and they will come up with something. The million dollar question is: is it what you want to hear? A brand has five components, which are shown in the graphic to the left. 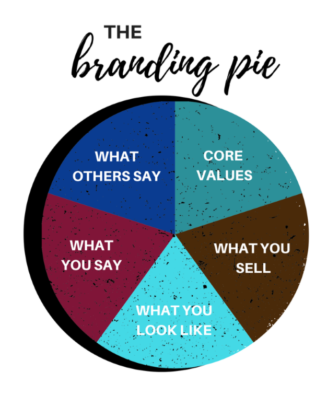 Your product or service (what you sell), your core values (what you value), your images (what you look like), your words (what you say), and customer experience (what others say) are the key ingredients of your brand. All of these are important, but I have seen countless business owners do something when it comes to prioritizing the pieces that holds them up and gets them off track. What is that something? It’s spending too much time on what you look like and not enough time on what others say. Sure, it’s fun to work on your logo, your colors, your “stuff,” but some people get stuck here and ignore something much more important. In reality, the thing that matters most in terms of business success is what I call BRAND CONGRUENCY. BRAND CONGRUENCY happens when the “what you say” piece of your brand matches the “what others say” piece of your brand. Customer experience is everything. If your brand promise (what you say) really comes true for customers, then what they say about you is positive. Promise made – promise delivered. Simple, right? If your overarching goal is to create brand congruency in your business, you can’t go wrong. Want to hear more about this? Watch this 15 minute video I made for a recent conference. Hopefully it will help you focus on what I believe is the biggest single contributing factor to ongoing success. And a few tips on how to make sure it happens. I think it’s worth a watch. Let me know what you think!